Well, a lottery of sorts. 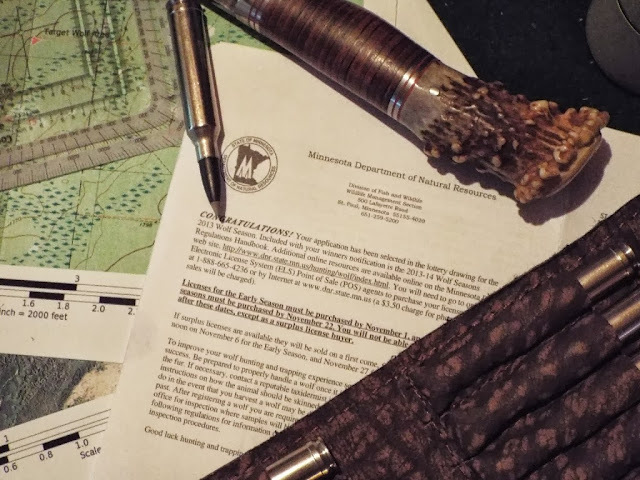 I applied for the Minnesota Wolf Hunt and was selected. I pulled a late season tag, November 30th through January 31st provided the harvest quota has not been met. As soon as I saw the congratulations I started dreaming and planning. I want to make this into an adventure of sorts, something that I'll never forget. 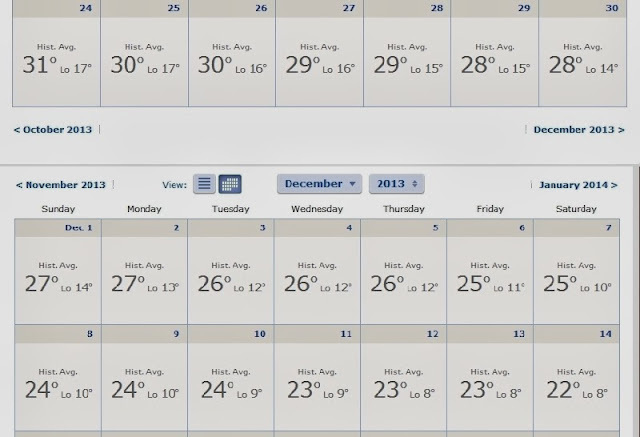 So I'm planning to spend between five and seven days in the wilderness in early December. I pulled the anticipated weather for the period because I'm hoping that we've had sufficient cold temperatures by then to have most of the waterways frozen, some of my travel includes being able to use a light sled to get my gear into the area I want to hunt. I'm working on some contingencies if the weather isn't right, so Plan B and Plan C are still being worked on. This post covers Plan A. This is what we're looking like for the dates I'm planning on going. I'm thinking much of the shallow water and perhaps more will be frozen. I'm not planning on crossing any big lakes over the ice but some of the back up plan does include trekking across ice if it is there, to some islands on nearby lakes. From there I'll have excellent line of sight across a large amount of territory, do some calling both wolf and coyote to try and get a response and have them come in. Using a 7mm Remington Magnum so I've got the range no problem. Just need the weather to cooperate for that tactic to work and be safe doing it. So Plan A was selected based on DNR observations and radio collar tracking. The triangles represent packs, diamonds indicate single wolves. You can see the density of the area I intend to hunt, incidentally that's about 18 miles as the crow flies from my home. So with the general area selected I started pouring over maps, I'm familiar with that area and have actually spent some time there. I found some pretty interesting stuff in the maps. 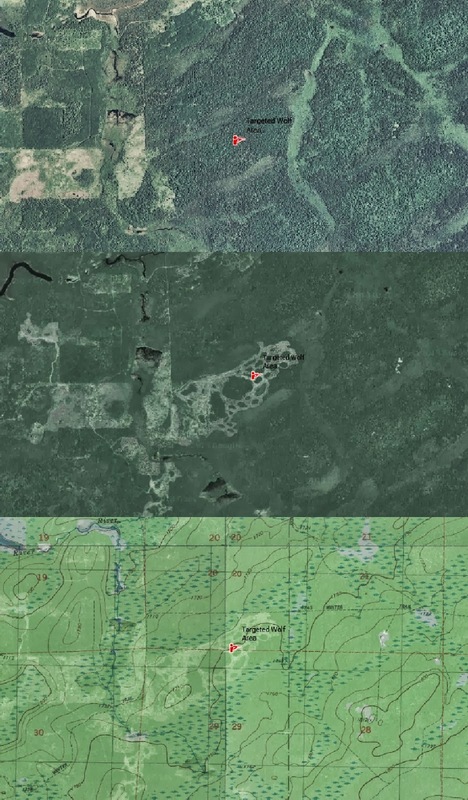 The area is roadless though there are some snowmobile trails and old logging roads, ingress will be on foot. Below are three maps pieced together. The top map is USTopo imagery from at least five years ago. 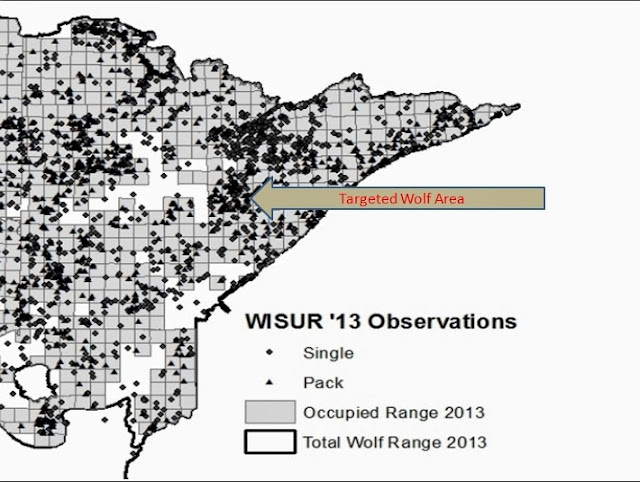 The second map is current (this year) satellite imagery, note where I've placed the targeted wolf area icon and compare to the first map. Sometime after 2006 and before the fall of 2009 the area where the icon is was logged off creating that pattern and those edges and open country. The third map is a hybrid I built using a 7.5 USGS topo and satellite imagery, did this with caltopo.com. The trails you see are not roads, their unimproved and mostly discontinued logging roads or snowmobile trails now. Where the icon is where I intend to hunt, there's some slight high ground there, and with the visibility I was thinking of using a locator howl in this area and then either try to howl them in via the howler or the coyote call, or perhaps even some standard predator calling. My plan includes loading all the gear I'll need into my pulk, the light version, and towing it in on foot and camping about 3/4s to a mile from the actual hunting area. With any luck we'll have some snow, past four years running we've had at least 5 to 8 inches of snow on the ground at this time of the year. I'm not planning on a hot tent so it'll be campfires each night, 0 degree down bag and HPG Mountain Serape. Tarp for shelter or tarp/primitive shelter combination. The plan is 5 to 7 days and with temps like those I'm going to be packing some meat in for protein along with some other things, though I hope to supplement food with rabbits and grouse so the .22 is coming as well. I'm completely stoked about this trip. 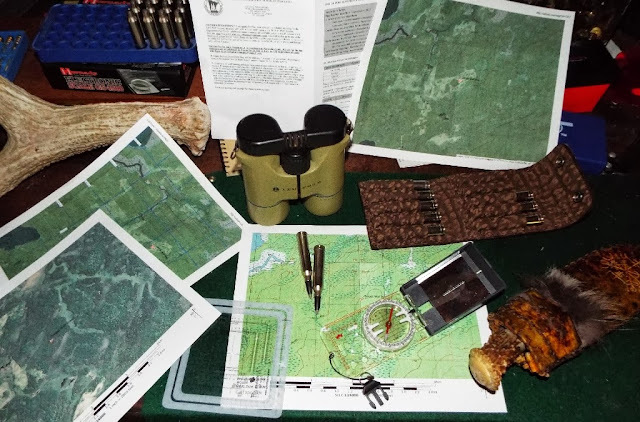 I spent some time last night in my reloading/gear room just pouring over all the information I could find on line and scrutinizing the maps. I loaded up forty rounds of 7mm Rem Mag, 150gr Nosler Ballistic Silvertip, using H1000 at 68grs, should be around 2900fps. I'm contemplating switching to Nosler partitions instead of the ballistics. The rifle is my Weatherby topped with a fixed 10x40. This set has been incredibly accurate for me over the years. Anyone want to toss me some advice or suggestions? I'm particularly interested in all the information I can get on wolf hunting tactics and experiences. Due to the nature of the content within this thread and past experience with discussions about wolves I would sincerely appreciate it if this doesn't turn into a debate. The point of this post is the planning and eventual completion of the adventure, lets leave politics out of it please. I can fully understand you being thrilled! I'd be! This sure sounds like an adventure. Will you be going alone or in a small group? The planningfase can be as much of an adventure and pleasure as the actual trip, at least for it is. Going alone, not a lot of other folks want to spend 7 days in the bush in those temperatures doing! Well that was one reason but primarily I want to go this one alone. Good luck and may this lotterywin bring you what you hope for. Fantastic! Sincerely happy for you. As an avid deer hunter, just sitting here thinking about the mindset change of going after a wolf. You are going to have a blast. I know nothing about hunting wolves in MN. My only suggestion would be seek advice from a trapper - no one knows the animals better. Best of luck! The only thing I can think of is; Make sure you take enough food. Maybe you will get some small game, maybe you won't. Don't count on it, let it be a pleasant surprise. Also wondered why you think of changing to the Nosler Partition, If it's more accurate, I could see it. Congrats and good luck, AG!